The earliest regimental system we know of originated in the Earth continent of Europe a development of that continent’s first nation states: France and England. An English regiment of the 18th century British Army, for example, would have three battalions. A 1st battalion of the best men and equipment would fight overseas in the continental European wars. The 2nd battalion remained in England to defend the home country. A further depot battalion billeted at the home base would train and equip new recruits, sending a stream of replacements out to the main two battalions and possibly perform garrison duties. The depot battalion would often be little more than an administrative concept, manned by a scattering of accountants, invalided veterans, and the idle rich masquerading as officers. When the army needed to be expanded rapidly to meet the demands of a new war, the regimental system was already in place to allow this. All the government needed to do was raise additional battalions for the existing regiments. The regimental system set up for the Human Marine Corps had to cope with completely different needs. The Human Marine Corps was mostly employed in the Third Frontier War, a series of fluid probes and parries by the Muryani and Amlxi around lightly held, minor systems situated 10-40 light years from Tranquility. When the depot battalion in France or England sent out replacements, they would reach the front line battalion within a few weeks. But if the two depots on the planet of Tranquility sent out similar streams of replacements to frontline battalions, the journey would be not weeks but decades. European replacements could sometimes take months chasing down their battalions in a fast-moving campaign. At modern distances of light-years, and transportation cruising speed typically half the speed to light, the problem of straggling replacements looking for their unit would make the whole depot system a joke. So instead of sending small streams of replacements to the front, fully formed companies or battalions were sent instead. As the strength of frontline units depleted due to losses, they merge and merge again. Veterans with leadership capability were sent back to leaven the green cadet battalions with a few experienced Marines. As for the problem of how to expand the army in the face of a crisis, the Human Marine Corps solved this by constructing reservoirs of cryogenically frozen Marines to be thawed out when needed. Indeed it has often be speculated that the only purpose of sending the Tranquility battalions to the frontier was to experiment with human military units under battlefield conditions. Any military contribution to the Third Frontier War was coincidental. The main purpose of Tranquility was really to breed and freeze huge armies of loyal Marines who would be retrained to the latest standards when thawed. Detroit alone was thought by some authorities to store over four million frozen Marines, each in a cryo box designed to be shielded from cosmic rays and micrometeorites and magnetized so the boxes would clamp together. Transport ships would tow these boxes in their millions between the stars. It would have been an astonishing sight, like city-sized reefs of frogspawn glittering occasionally in the dark of space. Would these interstellar shoals of boxed humans have been a thing of wonder or horror? Perhaps both. It is perhaps for the best because if those vast armies of frozen Marines ever truly existed, all lost before they could emerge. 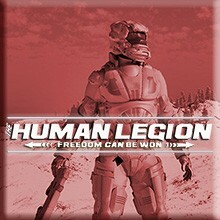 This topic entry has mentioned the Human Marine Corps, but what about the Human Legion? At this stage in the Human Legion’s development, the administrative policies for battlefield replacements are something for the future, but for our human warriors, at least, no one has suggested a better approach than that used at Tranquility. It looks as if the regimental system, originating from Earth’s ancient history, will spread through the galaxy for millennia to come. The 21st Century MODULE COMBAT TEAM seems like an organizational structure. That structure would still present logistics and supply troubles, but it’s perfect for unit specialization that’s mission specific. You’re right ther, SGT. Mike. At the beginning, the humans slot in as a very junior part of larger combined-arms units. When our characters break away and go it alone, they soon work out the hard way that isn’t good enough against serious opposition. They might not use that term, but what they end up with is pretty much the modular combat brigade. And I’m not just thinking about a combined arms table of organisation, but all the joined-up logistics too. 🙂 I loved history at school. For my ‘O’ Level exam (what we took at 16) I took 20th century history with Russian Revolution as the specialist subject. I remember being fascinated by the Czech Legion, which is what inspired me to write this series. For me it was reading about Thermopylae when I was in 10th grade world history!! It’s an addiction, the desire to always know more!! I think I know what you mean. The Greek, Macedonian, and Roman armies were what inspired me, thanks to the beautifully crafted books by the historian and writer, Peter Connolly. I am well aware of his work, and you’re lucky because you’re so close to it all!! England, unlike the USA, has tangible remains of what once was to inspire you!! I’m glad Peter Connolly reached that far. I’m fortunate in history-inspiration thing to be from Colchester, the first Roman capital, and still with large sections of the Roman walls still standing. They built things to last!